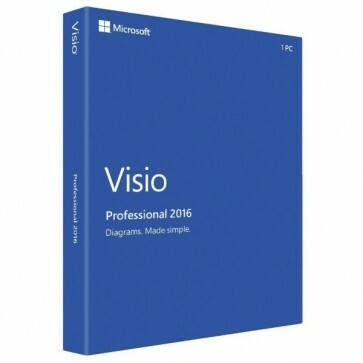 Microsoft Visio Professional 2016 Key is a digital product – no USB/CD box included. This product is a global license key. It's permanent and authorized! Both 32 Bit and 64 Bit are available, for 1 PC. Microsoft Visio Professional 2016 Product Key makes it easier for individuals and teams to create and share professional, versatile diagrams that simplify complex information. It includes all of the functionality of Visio Standard 2016 Key as well as updated shapes, templates, and styles; enhanced support for team collaboration, including the ability for several people to work on a single diagram at the same time; and the ability to link diagrams to data. Using Office 365, you can share these Visio diagrams with everyone. The Visio 2016 Quick Import capability now makes it easy for anyone to link data to real-world diagrams, plans and processes. With one-step data linking, you can easily turn diagrams into dashboards and monitor progress or performance in real time. Create professional diagram quickly - Whether you want to capture a flowchart from a whiteboard, map an IT network, build an organizational chart, document a business process, or draw a floor plan, Visio helps you lay out information in a way that’s easy to understand. Bring diagrams to life with data linking - Quickly overlay data on top of an IT network, manufacturing plant, or business process. As your underlying data refreshes, your diagrams and data visualizations update automatically. Collaborate throughout the process - Communicate and share your diagram across the enterprise through a browser with Visio Services in Office 365 or SharePoint. As your underlying data refreshes, your diagrams are refreshed in the browser. Work together on the same diagram at the same time and easily see reviewers' comments—in both Visio and Visio Services. Communicate one version of the truth - Share diagrams easily with anyone across your organization, from nearly anywhere. Simplify IT management - Keep everyone in your organization productive while freeing IT to work on more strategic initiatives.